Data center of modern times can turn out to be a vicious mess of cables and connectors if the cabling management issues are not handled smartly. One of the most basic requirements of achieving systematic cable network is easy tracking and effortless troubleshooting in case of any sort of downtime. Managers use color codes, splicing panels and other management solutions like ODF to track the cables back to its intended hardware. Another important product in the series of cabling management solutions is a fiber patch panel. A fiber patch panel is a mounted unit comprising of ports compatible with various connector types such as LC, SC, and MTP etc. Also known as cross connect patch panel, it serves as the storage solution for end-points of optical fiber cables. It allows the user to access the individual fibers of the installed cables in order to accomplish cross connections. Ideally, the fiber patch panel is mounted on a 19 inch relay rack; however, these panels can be installed in railings, cabinets and walls also according to the availability of space in the data center or similar kind of set-up. A fiber patch panel can be compared with a switch, structurally speaking. It comprises of a front plugged shorter cable and a longer cable connected at the back. It offers a sophisticated alternative to carry out the cross connection without messing the space and helps in easy tracking of the connected cables and hardware. 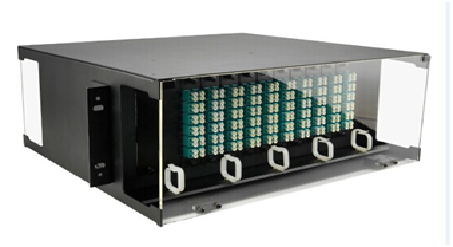 A cross connection patch panel can be dissected clearly into two parts – a compartment for the fiber optic bulkhead receptacle and another portion for splice trays where optical fiber connections are securely stored and excess cabling lengths are neatly stored. Some makers have patch panels comprising of a chamber (that complements wall-mount or rack-mount design), adapter panel, connector adapters ( can be any or all types such as LC, SC, FC, MTP etc), and splice trays. The patch panel may have all the adapters complementing LC or SC or MTP port only, or these may have a combination of ports to suit the need of the network that have a mix of these connectors. Since all data centers do not have same lay-out, the patch panels are also designed by makers such as Cozlink keeping the varied environments in mind. Here are some of the most popular fiber patch panels that have got the nod from the expert because of their compactness and ease of access. There are two types of fiber patch panels – wall mount units and rack mount units. The rack mount patch panels hold the fiber horizontally and have a shape like that of a drawer. It can hold 288 or more fibers and is designed in 1U, 2U and 4U sizes. The rack mount is further available in two designs – removable lid design and slide-out design. The latter is more expensive of the two but provides easy access to the fibers, whereas the removable lid design requires the expert to take the whole unit out in case of troubleshooting or any kind of integration process. MTP patch panel is the highest density patch panel. It is made extremely compact and ultra-slim to complement space restricted areas like racks, etc. 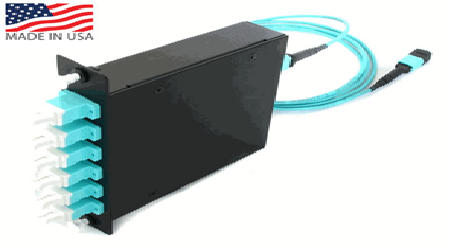 The more compact and portable alternative to an MATP patch panel is a fiber optic cassette module. 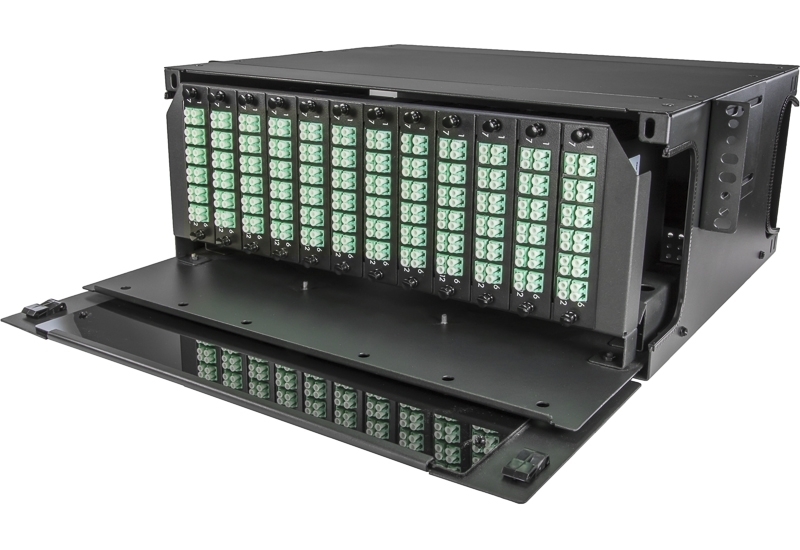 The rear of these patch panels have MTP adapters that can house 12-fiber or 24-fiber connectors characteristic of a 40G or 100G network, while the front of the MTP-LC patch panel have Quad LC adapters delivering high performance and better reliability. Other panels that comprise of single type of connectors are popularly known as LC patch panel, SC patch panel and likewise. Patch panels provide a very flexible arrangement for accommodating as many ports as required. Normally, the patch panel is designed in 12 and its multiple numbers of ports; but, the vendors do have customized solutions too for those who deal in high density data centers and require flexibility. A fiber patch panel provides sophisticated solution to the engineers for terminating the fibers securely. This panel not only allows better rack utilization but also enables easier network expansions or alteration programs whenever required. A pigtail or a field termination is used for integrating the patch panel into the network. 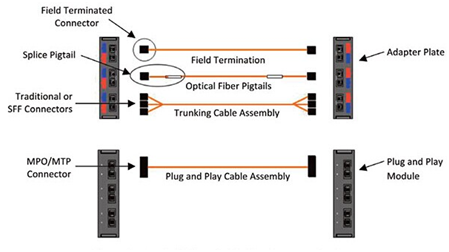 The use of pigtails is recommended for single mode fiber connectors. Use of pigtails requires splicing trays and it offers the best quality connection that an expert is to establish most quickly. In a field terminated connection, the splice tray is not required. A fiber optic connector is used to establish the connection. This method is not as reliable as a pigtail connection which comprises of pre-terminated pigtails. It may require managing excess cable lengths and setting up it takes longer than a pigtail connection. Know all about the fiber patch panels to make a selection that suits the requirements of a data center. Cozlink offers the most popular fiber patch panel types designed for the data center environment of the customer’s preference. Patch panels help manage the cabling infrastructure in minimum space and offers easy access and tracking for faster troubleshooting.